Carly’s an interesting character to me, just because of how she came about. 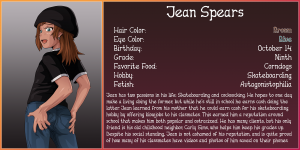 When I first drew her, I didn’t have anything in mind for her besides being a classmate recording Jean in action, but then she kinda developed around that fact. Through Asks and then later a Snapshot it was decided she wasn’t just a classmate of Jean’s, but his best friend who is also kinda obsessed with his whoring. She’s got a bit more to her now with this Bio, and I think I’d like to try doing some more with her some time in the future. So I don’t believe Mrs. Brant had a first name at any point before. For the sake of this Bio entry, I decided to give her one. I really like Mrs. Brant, of the girls Mace and Jackie have teamed up on she’s probably my favorite. I’ve had several ideas for more content to do with her, some of which is hinted at in the text portion of this pic. I don’t know which of my ideas for her will get materialized first, but I’m confident she’ll show up in the Applebridge Snapshots series sooner or later. 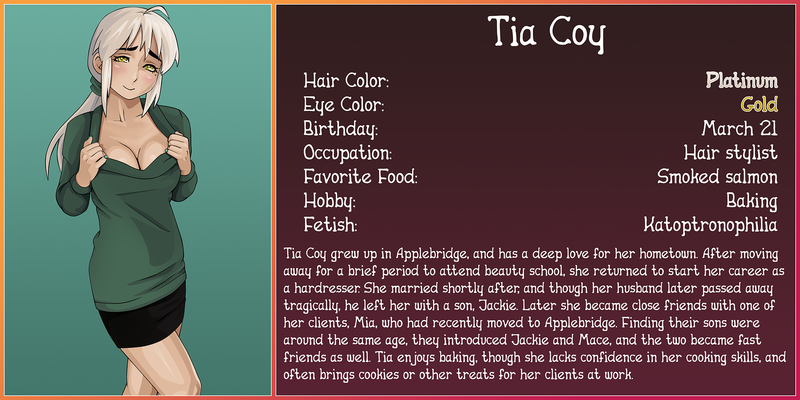 Here’s another biography for the Applebridge series! This one’s for Applebridge’s resident futa and the partner of Terry Birch, Mickie Cummins. Her bio lets us fill in a few of the gaps from what information I’ve shared about her before, since I’ve mentioned a few things in her handful of appearances but haven’t explained them in as much detail as I have here. I’m trying to do at least one of these bios each month (though who knows, it’s certainly not set in stone). I haven’t decided who will get the next one, but there’s still a lot of characters to work through! 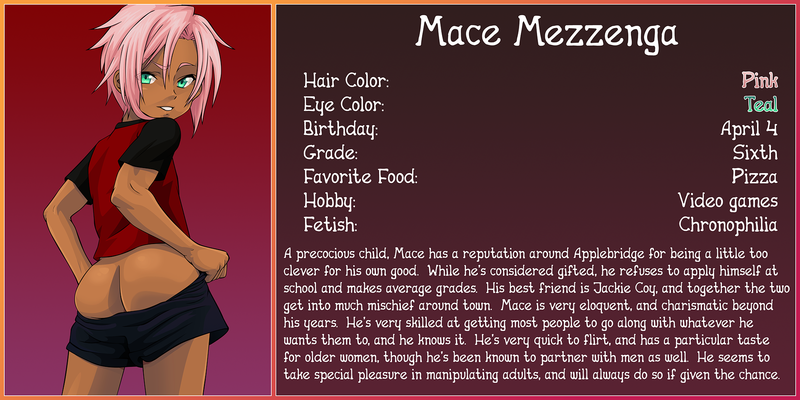 Took me longer than I thought, but here’s the third Applebridge Bio page. This one’s for Loren Cox, who’s quickly become quite popular since I first introduced him a while back. He seemed like the natural choice to go with after Mace and Jackie for one of these. I decided to dress him up in the sort of outfit he’d probably wear for a night out on the town trying to pick up guys. Here’s a new entry for the “Applebridge Bios”. Like the Mace one I did last month, it’s just some basic info along with a kinda risque pic. I haven’t decided which Applebridge character I want to do for the next bio, since there are a lot to choose from at this point, but I’m sure one will show up sooner or later.